My little boys are 21 weeks old this week and it has just flown by. When I look back at those first few weeks having newborn twins I think, goodness I don’t know how we did it; we did and at the time I even thought, ‘this isn’t so bad.’ Definitely not as tough as I had imagined but I’d learnt A LOT from my first child so I was prepared. 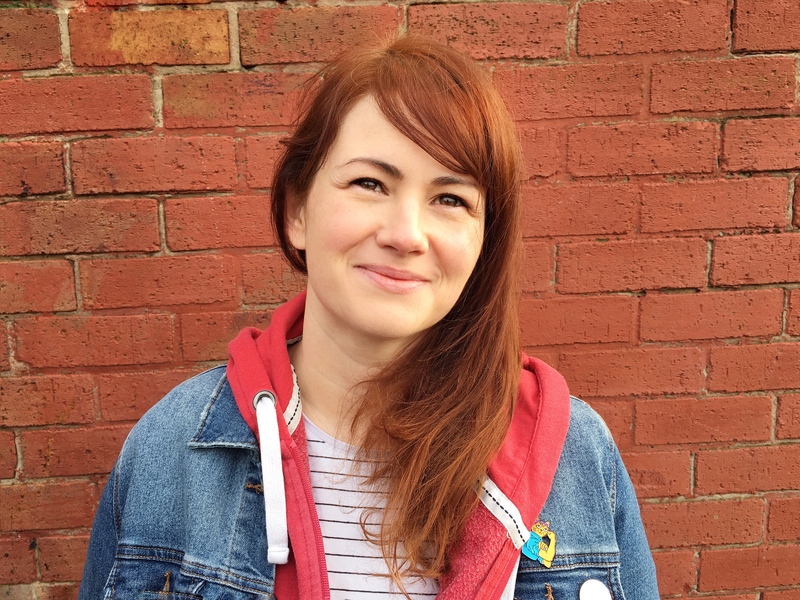 I thought I’d share my top tips for getting through those early weeks with some sanity! These are the things I found most important but everyone is different and whatever works and feels right for you is best, this is just what I found worked for me! So, I realise having a routine doesn’t suit everyone but if there was just one piece of advice I would give to new parents of twins it would be to have a routine. It doesn’t mean that you have to be rigid and stick to it religiously but I promise it will make your life easier. Our twins were in a loose routine straight from when we got home as I couldn’t disrupt my eldest’s life too much so it had to fit round him. I have always fed them together, put them down for a nap together and went through the bedtime routine at the same time. When one woke for a feed in the middle of the night we’d wake the other one and feed together, then they would both go down together and sleep for a few hours till the next feed. At least this way you get a couple of hours sleep in between feeds. I had set times when they would be fed but in the early weeks these were flexible and often needed top ups inbetween. I always tried to keep them in routine as much as possible so it didn’t impact too much on my toddler; if I knew when the next feed was due I knew I had some time to give to him first. This way he kept his mealtimes and bedtime the same and it lessened the shock for him. It took us until about eight weeks to work out how to manage bedtime with all three but we are there now. It doesn’t all come straight away and it’s hard work to keep going but as time goes on I’m so glad we stuck at it as it has made it easier now. Anything that you don’t desperately need to do, don’t do it! 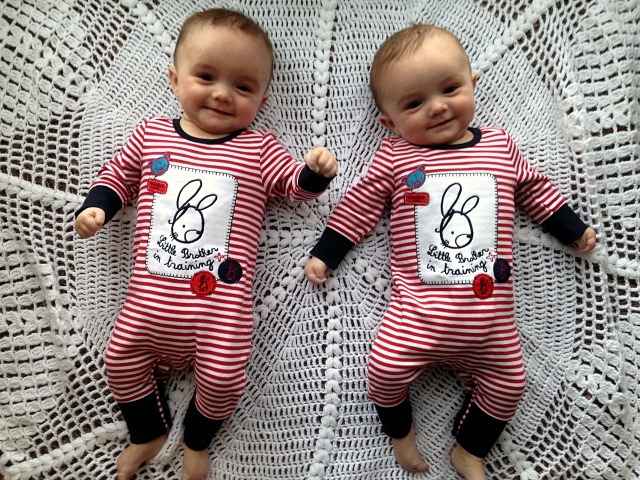 My boys are coming up to 5 months and they are rarely out of sleepsuits! I have nice sleepuits that I keep for best, the gorgeous rompers in the picture I bought from The Essential One with a competition win and they are so cute but more importantly they are easy to put on, change quickly and wash. I love seeing babies in little soft sleepsuits so I’m making the most of it. I didn’t go out much in the first couple of months, but they were December babies so it was too cold, especially with a toddler in tow. I did the bare minimum of housework and I really mean the minimum; we are talking dishes, washing and the very odd hoover; basically if I could get it done in 5mins I’d do it. I know not everyone finds it easy to let the housework go but it will give you more time and personally I’d rather have a quiet cup of tea than polish the coffee table! Accept any and all help that comes your way. It’s a bit more difficult with twins as it’s harder for someone to watch both of them while you sleep so I accepted help in other forms, cooked meals were an absolute godsend! Both my mum and mother in law stocked up our freezer so there was always a good meal waiting for us and my mum took my excess washing to give me a hand. Friends came round with snacks, people picked up bits of shopping for me and nappies. When we weren’t getting out my mum would take my eldest for walks and she’d take to me the shops. If you really don’t have anyone who can help consider getting some help from Home Start or you can speak to someone at TAMBA on their helpline. You may need that little bit extra support, even if it’s just someone to talk to. If you can meet other twin mums in your area talk to them, see if there is a twin playgroup or meet or even a regular playgroup that has some extra helpers who can give you a hand. Speaking to other mums who are going through the same things you are can be the best kind of support. Don’t feel guilty or that you are putting on people, if anything gives you an excuse to need help it’s having twins and in my experience people are more than happy to help in any small way they can. Before the babies arrive have everything you think you’ll need where you need it. We had stockpiled nappies and we had a mini changing station in nearly every room of the house. I had a store of baby clothes downstairs as well as upstairs. I had a safe place for the babies to be in every room, we had a travel cot in the living room for those early weeks, a crib in our room and a cot in their nursery. If you need to put them down quickly it’s good to know they are safe. The change bag was always well stocked so I wasn’t rushing around if we needed to leave the house. We even had apps on our phone to keep track of when they fed and how much they had. It’s surprising how quickly you forget these things and it meant my husband knew when the next feed was due when he came in from work. I have a basic shopping list saved to do a quick online shop if we were running low on essentials and I made sure I had plenty of boring household bits in the house, like toilet roll and washing tablets; the last thing you want to worry about is running out of that. It is special becoming a parent and even more precious when you become a parent to twins. It sounds clichéd but it truly does bring double the joy and I can honestly tell you that the hard work is worth it. There are really difficult spells and the sleep deprivation really is hard going, when you start to get more sleep you will feel like you can conquer the world! Enjoy little things and take the positives from them; when your babies smile at you and then even more so when they smile at each other. Enjoy having two babies and all the attention it brings! I think before they arrive you need to get in the right frame of mind; yes, you know it’s going to be hard! The newborn weeks are tough on every parent but you can do it because you have to do it! I know people think it may be harder with an older one too but it’s actually been easier, having my first was the best preparation I could have wished for and in many ways I’ve found it easier with the twins. I’m more relaxed, I’ve found it easier to let the little things go, easier to ask for help, easier to admit I can’t do it all and more confident in doing things my way! Any tips to add please let me know, and any advice for getting though the next stages with twins I’ll be very grateful for! If you liked this be sure to check out my twin page with other twin posts, twin baby diary and links to other helpful twin websites and blogs. It sounds like you’re doing a great job, thanks for sharing your experience and advice. OH Hayley, your little boys are just gorgeous. Those smiles make your heart melt! 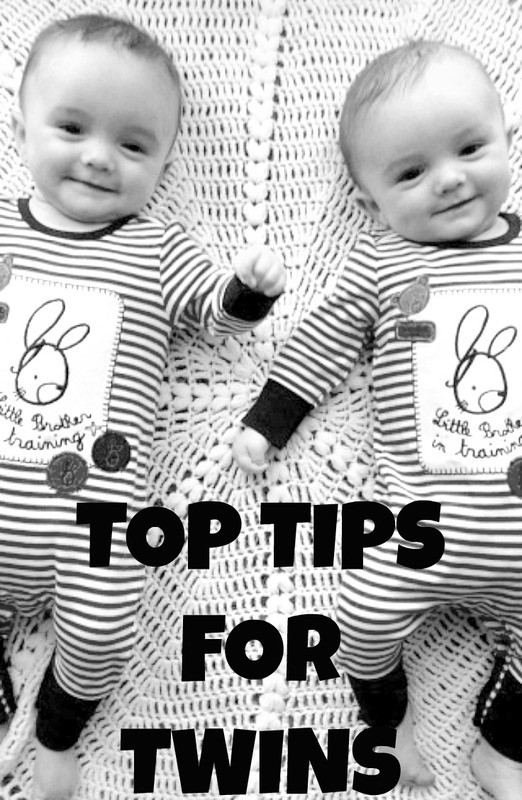 Not likely that I’ll ever have twins now but all sound extremely handy tips for singletons too! I just want to thank you for this post. I am twenty weeks pregnant with twin boys and most of what I read is negative in some way. It is disheartening! But this post gives me faith that I’ll be able to handle everything and actually enjoy it as well. Thank you!!! My twin boys were born August 3. I had an amazing pregnancy and have had such a great time with them these past 3 months. Don’t be scared. It’s all is your attitude. These tips are so spot on!!! Of course there will be sleepless nights and some “hard” times, but it gets easier. Enjoy every minute of it as it flies by so so quickly. Congrats Kristen. welcome to the twin club! This was a refreshing read after hearing mainly horror stories and being told how hard it is going to be. Thanks! In the department of staying organized; ALWAYS have your bottles prepped and ready at least 3 feedings ahead of time. If your breastfeeding – have a backup plan if you’ve just pumped. When they are hungry – they are hungry NOW and every second counts towards maintaining your sanity and quickly satisfying 2 screaming babies @ the same time! Yes, that is a good tip. Our fridge was overflowing with bottles ready to go, you just need to do it quickly! I have two sets of twins. 7 year old twin girls and now 16 month old boy girl twins. My advice would be it’s great to have a routine but be flexible enough and don’t get stressed when it doesn’t work out. If one sleeps and the other is awake enjoy the one on one time. Remember tomorrow is a new day and maybe the routine will work. I remember being so much more stressed with my first two if they didn’t eat right or nap as I wanted them too so definitely take things one moment at a time. Thanks for all the tips. Our twins are due at the end of June. As a first time older mum I need all the tips I can get. It’s nice to read positive things. It’s been a hard pregnancy so far with a lot of sickness but I’m slowly sorting things out. Great set of tips! What app sido you’d use to keep track of feedings etc?? I’ve just had a look and it was baby feed timer, it’s still on the app store but I’m fairly certain you had to pay for it! Hope you find it useful!